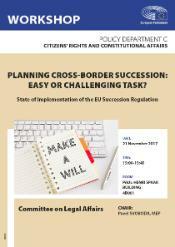 21-11-2017 - Planning cross-border succession: easy or challenging task? Two years have passed since the EU Regulation No 650/2012 on Succession entered into force. Legal professionals, who have now gained a degree of practical experience in applying the new rules, were invited to share their views as to the strengths and weaknesses of the EU legislation on successions. It was the purpose of this Workshop to provide a first state of play of the implementation of the EU Regulation on cross-border succession, with a view to determining whether it is fulfilling its goal of ensuring legal certainty, predictability and simplification for citizens. The experts participating in the workshop assessed whether - in the light of their professional experience - the new rules are simplifying the planning and settlement of cross-border successions, or whether their application poses legal and practical challenges or difficulties. This workshop also offered an opportunity to present the key findings of the following study commissioned by the Policy Department for Citizen's Rights and Constitutional Affairs: 'The evidentiary effects of authentic acts in the Member States of the European Union, in the context of successions'. This study provides an important toolkit for legal professionals dealing with cross-border successions.